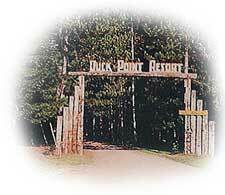 Welcome to the Duck Point Resort! Join us in our celebration!!! Located in the Heart of the Northwoods, just outside Tomahawk Wisconsin, the Duck Point Resort is a great place to get away from it all. Leave the stress of the work day behind and relax in the fresh and cool Northwoods air. The Duck Point Resort is family friendly with something for everyone.